You may be the kind of person who fires up the grill all year long at tailgating parties, or maybe you wait for a warm summer day and a backyard full of friends before you put on your apron. Either way, grilling can be one of life’s simple pleasures. Unfortunately, where there is fun there is also the potential for safety issues. For example, did you know that leaving the grill unattended, not cleaning grease or fat build up properly, or placing the grill too close to combustible siding can cause injuries, fires and property damage? Nearly 9,000 home fires a year involve grills, according to a National Fire Protection Association report. Of all the home fires involving grills, gas-fueled grills accounted for four out of five fires, while 16% involved charcoal or other solid-fueled grills.¹ Gas and charcoal grills each have ardent advocates, who praise the convenience of gas or the flavor of charcoal. 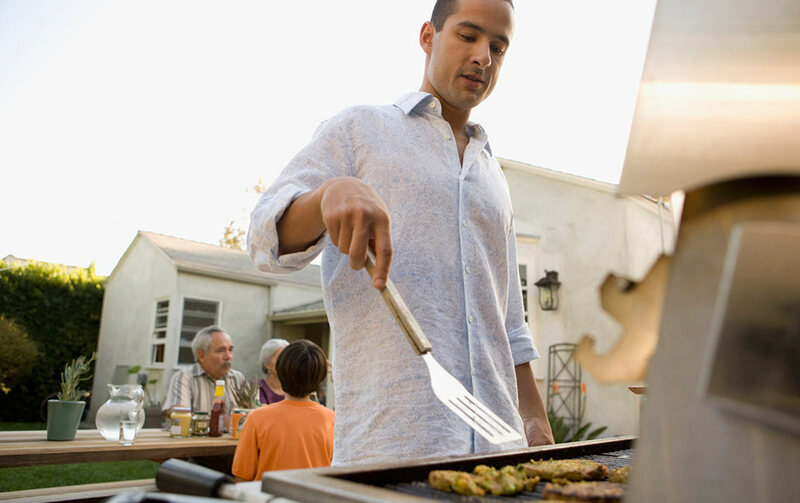 Whichever your preferred grilling method, follow these important safety considerations. A leak or break was the leading factor contributing to gas grill-related fires, according to the NFPA report. Check the gas cylinder hose for leaks before using it for the first time each year. Apply a light soap and water solution to the hose, which will quickly reveal escaping gas by releasing bubbles. If you smell or otherwise suspect a gas leak, and there is no flame, turn off the gas tank and grill. If the leak stops, get a professional to service it before using it again. Call the fire department if the leak does not stop. If you smell gas while cooking, get away from the grill immediately and call the fire department. Do not attempt to move the grill. Never turn on the gas when the lid is closed. The gas may build up inside, and when ignited, the lid could blow off and cause injuries or burns. After cooking, make sure you completely close the valve on your gas grill. Always store gas grills – and propane tanks – outside and away from your house. The leading cause of structure fires from use of charcoal grills was leaving or placing an object that could burn too close to the grill, according to the NFPA study. Charcoal grills can continue to remain hot for many hours after the flames extinguish. Avoid placing any burnable objects near the grill or moving the grill while the coals are hot. Keep combustible items that may be blown by the wind away from the grill. Check for rust damage in metal grills, which may make it possible for charcoal to fall through onto surfaces below and cause a fire. Purchase the proper starter fluid. Store out of reach from children and away from heat sources. Do not add charcoal starter fluid when coals or kindling have already been ignited. Never use any other flammable or combustible liquid to get the fire started. If the fire is too low, rekindle with dry kindling and more charcoal if needed. Avoid adding liquid fuel because it can cause a flash fire. Here are some other important tips to help you keep danger away when you are enjoying food and fun. Choose a safe location for your grill. Keep grills on a level surface more than ten feet away from the house, garage or other structures. Keep children and pets away, as well as overhanging branches. Grills should not be used on a balcony or under an overhang. Avoid placing grills too close to combustible deck rails. Grill outside only. Never use a grill in a garage, vehicle, tent or other enclosed space, even if ventilated, due to risk of harmful carbon monoxide buildup. Keep the grill going on a cold day. During cool weather days, avoid wearing a scarf or other loose clothing that may catch on fire. Consumer Reports recommends shielding the grill from wind, placing it about ten feet from combustible surfaces and materials, and keeping the lid closed to retain as much heat as possible. Allow extra time for pre-heating the grill in colder weather and check temperatures of meat and fish with a meat thermometer to ensure that food is safe to eat. Remember post-grilling safety. Keep your grill clean by removing grease or fat buildup from the grills and in trays below the grill. If you grill with charcoal and need to dispose of the coals, soak them in water to extinguish them before disposing in a metal container. Otherwise, cover the grill tightly and close the vents, this should extinguish the coals and whatever is left will be ready for next time.